I hope you are enjoying a smooth transition from the spring semester into the summer months. Our past academic year has been a very good one across a number of fronts. As you can see below, summer credit hours are up 4.1% over last year. As you will also notice, summer enrollment contracted for six consecutive years from 2009 to 2014. We have gained considerable ground over the past three years, with this year representing our largest year over year growth. Although our summer enrollment is relatively small compared to the regular academic year, it is critical to our retention and completion efforts, and certainly a very good sign. Along those lines, our current enrollment for the fall semester is up 9.4% compared to this point last year, likely reflecting success in our many retention initiatives. We do not expect such a large increase to hold until fall enrollment is complete, but it is a remarkably encouraging sign. Thank you for your hard work on behalf of our students, University and broader Memphis community. An update on final raise recommendations will be shared this coming week, prior to our Board of Trustees meeting. Our next academic year is shaping up to be a very good one, particularly on the heels of a very successful legislative session. Taylor Mayberry, a rising senior at the University of Memphis majoring in Nursing (Class of 2018), has been selected for appointment as the Student Trustee on the University of Memphis Board of Trustees. She is a 2013 graduate of Germantown High School in Germantown, TN. Taylor is currently the President of the Student Nurses Association and serves as the Secretary of Health Care for the Tennessee Intercollegiate State Legislature. As a member of the Student Government Association, in 2016-2017 she served as Chief Justice of the Student Government Court. Taylor was named a finalist by the Student Trustee Selection Committee, and I will recommend her to the Board of Trustees for approval at the June Board meeting. Please join me in congratulating Taylor on her nomination as the first Student Trustee at the UofM. Now that the Tennessee state budget has been approved by the House and Senate, and is awaiting the Governor's signature, listed below is a brief summary of the implications for the University of Memphis. Next Tuesday, there is a meeting with the Director of the Tennessee Higher Education Commission regarding creation of an "Emerging Research University Fund" for the coming fiscal year set. I am optimistic about this initiative. Given that we now have an approved budget, we will be moving forward with salary and tuition recommendations at the Board of Trustees meeting in early June. I will forward information about the salary recommendation next week, along with data regarding summer enrollment which is trending in a positive direction. I hope your summer months have started well. 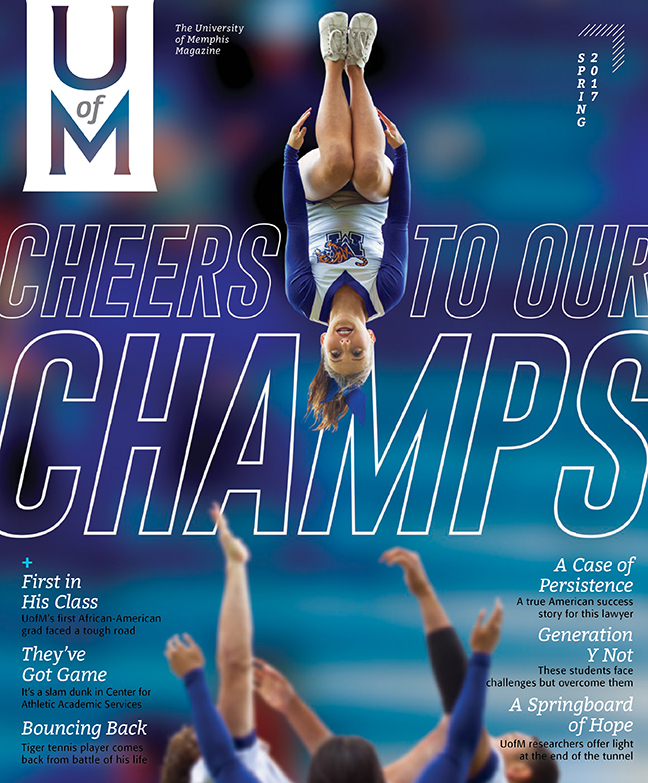 Our latest issue of The University of Memphis Magazine highlights the extraordinary achievements of our students and the faculty and staff who support their many accomplishments. Get to know our Cheer team, which won the national championship of the Universal Cheerleaders Association, and our student athletes, whose athletic and academic success is recognized nationally. We have also chronicled the personal and professional journeys of two of our alums – Luther McClellan, the first African-American graduate of the University, and Donald Godwin, who provides a testimony to the benefit of persistence. The University of Memphis has entered an exciting new era with the confirmation and inaugural meeting of our new governing board, the University of Memphis Board of Trustees. This board, made up of eight business and community leaders, a faculty member and a student representative, will position the University to grow and compete nationally. Read more about our board in the Trustee Spotlight section of our magazine. We have always sought to form partnerships that strengthen the community. Throughout these pages, we discuss how researchers at the UofM are finding ways to overcome life circumstances that serve as barriers to success for many children in the region through partnerships with community organizations. It truly is an exciting time to be part of the University. Go Tigers!